In this section, you update the configuration of the MakeAppointment intent to use the Lambda function as a code hook for the validation and fulfillment activities. 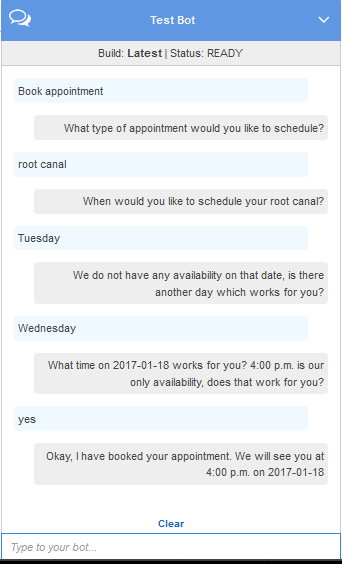 In the Amazon Lex console, select the ScheduleAppointment bot. The console shows the MakeAppointment intent. Modify the intent configuration as follows. You can update only the $LATEST versions of any of the Amazon Lex resources, including the intents. Make sure that the intent version is set to $LATEST. You have not published a version of your bot yet, so it should still be the $LATEST version in the console. In the Options section, choose Initialization and validation code hook, and then choose the Lambda function from the list. In the Fulfillment section, choose AWS Lambda function, and then choose the Lambda function from the list. Choose Goodbye message, and type a message. Choose Save, and then choose Build.